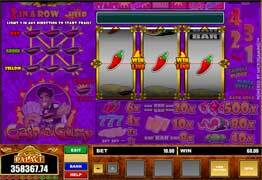 Beer, Cash and Curry are part of the Cash ‘n’ Curry online fruit machine. It has a top jackpot of 500 times your bet and gives you the chance to win up to 2,000 times with the Curry Go-Round Super Jackpot on the trail bonus game. Cash ‘n’ Curry is a very classic style fruit machine with a trail based bonus game. The theme is obviously an Indian diner. Like most fruit machines it has the random option to hold the reels and a nudge feature. The nudge feature also offers a nudge game, a nudge hold and the peek buttons above the reels can come in handy. So Cahs ‘n’ Curry really offers several ways to win big!! You can play from a minimum of 10 Cent and offers frequent wins.